Summary: A weak protagonist and an even weaker ending overwhelm what could have been a strong and thoughtful novel. 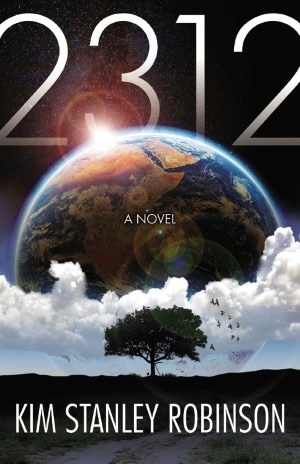 2312 presumably takes place within the same universe as Kim Stanley Robinson’s Mars trilogy, but it fails to live up to the thoughtfulness and epic scope of those books. The protagonist is a silly, shallow, self-absorbed dilettante who flits about the solar system, moving from one distraction to the next like a 24th Century Paris Hilton. We’re told that she was intelligent once, but apparently her penchant for novelty via various body and brain modifications has rendered her into a vacuous sensualist with an implanted AI. Indeed, one of the major discussions threading the novel is whether an AI could achieve consciousness, and if so, how could you tell if it had? In one of the major ironies of the book, the main character is someone who is so one-dimensional that you’d have a hard time distinguishing her from a simple AI. A weak protagonist can be easily overcome with a strong plot, which this book has for 90% of its length. There’s a mystery surrounding terrorist attacks on spacer colonies in the solar system, coupled with odd and potentially dangerous qube (quantum computer) behavior. Throw in an increasingly desperate and depressing Earth (which in the novel has basically become the solar system’s Africa), and you have a story threading together various inferences that seem to lead toward an epoch-shattering conclusion. Alas, ’tis not to be. The general malaise throughout the book remains unresolved and humanity continues along its meaningless path. The problem with the qubes, which could have represented a new era for humanity by having a novel, alien intelligence with which to interact and learn, is quickly resolved and dispatched in a few paragraphs. The central mystery of the novel–terrorist attacks on spacer colonies–turns out to be nothing more than an unintended consequence of a minor real estate dispute involving characters who are barely mentioned in the novel. The slow, gathering surge toward an epic conclusion merely peters out in the end. It’s almost as if the author, after painting a picture of humanity as a stagnant people who are merely distracting themselves until they die (ironically delayed due to longevity treatments), was afraid of the potential transformative power his qubes represented and pulled back for some reason. As I read the book, I actually thought the protagonist was a thumbnail for a moribund humanity who’d reached the limit of its abilities. It was almost as if the human race was bumping up against a wall which, for all of the mind and body enhancements, it could not conceptually break through due to fundamental flaws in its construction. There’s a lot of movement and apparent progress, but when observed from the macro level the species is just spinning its wheels. There’s a lot of heat, but no fire. The qubes, who appear to be evolving and perhaps even self-aware, are appearing in human bodies that are indistinguishable from the genuine article, much like the cylons from the rebooted Battlestar Galactica. It seemed like the book was heading to a point where these qubes would in some way transform human society and break it free from its stagnant state. Instead, all of the build-up involving these new qubes is swept away with not much said about what they were or what they could become. The book could have ended with the genesis of a post-human society, or at the very least a humanity with some sort of hope for the future. Instead, it ended where it began and reading it turns out to have been an exercise in futility, much like humanity’s existence in the book. Despite all that, I would still recommend picking up this book at the library since it does generate some food for thought (if only incidental to the main story), plus it features some high imagination, from surfing Saturn’s rings to a city crawling along Mercury’s terminator (and what happens when it stops). Just don’t expect to be treated to the epic breadth and depth of ideas presented in Red Mars and do not expect a big, world-changing ending.